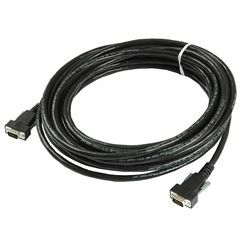 Connect analog video equipment together with this heavy-duty SVGA video cable. With 15-pin male DE15 (HD15) connectors at both ends, this cable can be used to send VGA video signals over significant distance. Its insulating jacket is flame resistant and rated for use in plenum spaces.